After last week's slew of info on the Assassin's Creed movie, it's now been pretty much confirmed that The Wire's Michael K Williams' character Moussa is the movie's first link to an in-game Assassin. While Moussa meets Michael Fassbender's modern day character Callum Lynch in the 21st century, his genetic ancestor is an ex-Assassin called Baptiste. 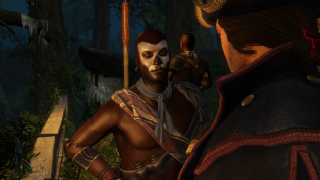 If you played the New Orleans set Assassin's Creed Liberation, you'll know of him as the voodoo leader of a cult of slaves who sided with the Templars and was duly executed by Aveline de Grandpre. “My character, he’s in this prison, whatever this place we call it. His name is Moussa," explained Williams in an interview with Screenrant. "When he becomes an Assassin, he’s going to channel his ancestor, which is a voodoo poisoner who has been dead for about 200 years. His name is Baptiste”. He had previously described Baptiste as being from a Caribbean background, which goes further to confirm the link to Liberation. In the game, Baptiste is originally from Saint-Domingue (now Haiti) before moving to the Louisiana Bayou. Williams also revealed a little more about relationship between Moussa and Callum Lynch in the 21st century while they are imprisoned inside Abstergo. "Moussa is what we call the trickster. His whole thing when Cal comes into the prison, he sees him as the missing link to the puzzle and immediately realizes that we need to bring him into the fold, the family, and to make him feel safe in this room full of crazies," he confirmed. "So that’s Moussa’s relationship to Cal right now, is to bring him into the family, make him feel comfortable, and to let him know that we all need to get out of here". Alongside Moussa and Lynch is a character called Lin who I'm pretty sure is the genetic ancestor of Assassin's Creed Chronicles Shao Jun. She is described as a Chinese Assassin who is "precise but deadly, just like the Assassin she discovers in her genetic regressions, who is well-travelled and hardened by the struggles of life for a woman in 16th century China". Given that Shao Jun travelled to Italy from China to seek the help of our favourite Master Assassin Ezio Auditore in 1524, that makes her both well travelled and, more importantly, in 16th century China. Consider that speculation for now but I'm pretty certain. Check out some of my thoughts from the first fifteen minutes of Assassin's Creed.